Gokarneshwar is a municipality in Kathmandu District in the Province No. 3 of Nepal that was established on 2 December 2014 by merging the former Village development committees Sundarijal, Nayapati, Baluwa, Jorpati and Gokarna. The office of the municipality is that of the former Jorpati village development committee. In the village on the banks of the Bagmati River stands the Gokarna Mahadev temple, built in 1582. In late August or early September people go to this temple to bathe and make offerings in honor of their fathers, living or dead, on a day called Gokarna Aunsi. The Gokarna Forest Reserve is located in the area. Nepal Medical College and Teaching Hospital is located Southwest of Gokarneshwar. 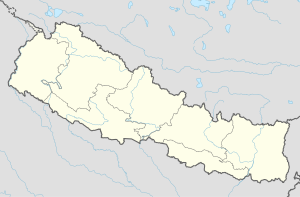 Gokarneshwar municipality has a total population of 107,351 according to 2011 Nepal census. At the time of the 2011 Nepal census the village had a population of 7,508 with 1,768 households. Writer Ramesh Bikal was born near Gokarna in 1932. ^ "Govt creates 61 new municipalities". República. 3 December 2014. Retrieved 2 December 2014. This page was last edited on 7 November 2018, at 15:10 (UTC).